See What Happened at the 2018 Show! 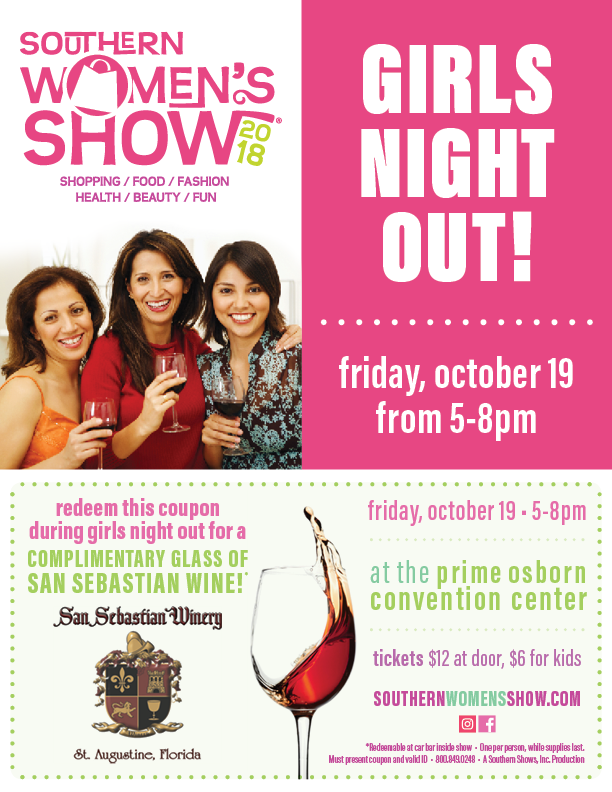 Grab your girlfriends and join us for Girls Night Out at the Southern Women’s Show on Friday from 5-8pm. Admission is just $5 after 5pm! Enjoy an evening of shopping, wine, entertainment, and fashion shows all under one roof. Print the online coupon here for a complimentary glass of San Sebastian Wine on Friday beginning at 5pm (with valid ID, while supplies last). Join us on Friday at 6:00pm and Saturday at 5pm at the Fashion & Entertainment Stage to see the Jacksonville Firefighters burn up the catwalk for a great cause! They're back and here to prove there’s nothing better than a man in uniform so bring your besties, your dollar bills, and don’t forget your cameras! All donations go to support the Jacksonville Firefighter Charities. The Jacksonville Firefighters will debut their brand new 2018 Firefighter Calendar at the show! Stop by their exhibit in space 837 anytime during the Southern Women’s Show to pick up your copy. Kendra Scott was founded on the mantra "Family, Fashion and Philanthropy." As their brand has grown, they have continued to hold philanthropy as one of their core values. Last year alone, they raised over $3.5 million for local charities through their Kendra Gives Back programs. Join Plant Nite on the Spotlight Stage Friday at 5:30pm for a customized, creative, and memorable experience and plant to keep! Sign up at the show for just a $10 materials fee for this delightful Mini Garden Session.